Miriam Wagstaff, 16, lives in Tropic Utah, located under the rim of Bryce Canyon National Park. A homeschooler, she commutes regularly to Utah County where she studies violin with Prof. Monte Belknap, viola with Dr. David Dalton, and serves as concertmaster of the Lyceum Philharmonic Orchestra conducted by Kayson Brown. Miriam previously studied both instruments with Denise Willey, beginning violin studies at the age of six with Megan Cottam. 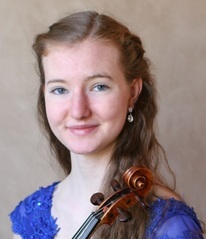 Awarded a full scholarship to Idyllwild Chamberfest this coming summer, Miriam will study with Gina Coletti. In the summer of 2015, she attended Meadowmount School of Music as a full-tuition FASE Award Recipient. Also in 2015, Miriam received 'Honorable Mention' from the National ASTA Solo Competition 'Junior Viola Division', and 'First Place' Utah Baroque Ensemble High School Scholarship Competition. Miriam has performed in masterclasses for violists Paul Coletti, James Dunham, and Brad Ottesen, and for internationally known fiddler, Natalie MacMaster. She has soloed with the Lyceum Orchestras annually since 2012, with the Utah Valley Symphony school program twice, with the Southwest Symphony Orchestra and with the Orchestra of Southern Utah. At the recent Youth Guild Recital Auditions she was awarded 'Honorable Mention'. May 17th, 2016 she will perform the complete David Concerto with the Utah Symphony as the All Star Evening Soloist. Miriam was invited to Colburn to audition in person on both violin and viola in February, and has been granted admission to the Colburn Music Academy Fall 2016 on viola with an invitation to concurrently continue violin studies through the Colburn Community School of Performing Arts. Miriam is also an award winning fiddler.